The Puritans received their name from their desire to purify the Protestant faith. Puritans believed that they could honor God and achieve salvation by working hard. They also believed that God would reward the hard working with prosperity. Max Weber tells us that Puritans worked with a special zeal to honor their God, and the rewards they received offered reassurance that God approved of their efforts. 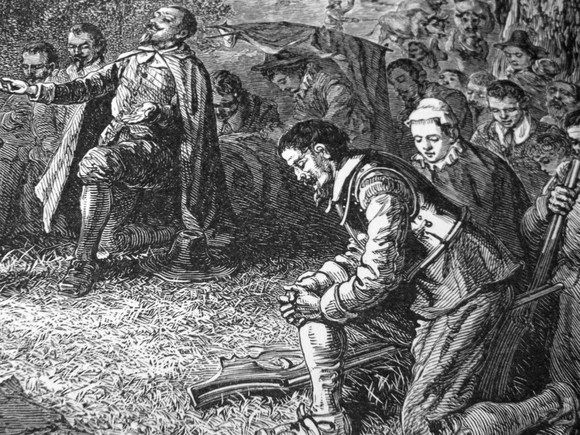 Puritans believed that by praying, living morally, reading the Bible, and attending sermons they were preparing for the possibility of God's saving grace. At the time, in England, the church and state were considered one and everyone attended the Church of England (Anglican). The Puritan reform movement wanted to change the Church of England and English society as a whole. It was their desire to recapture the simple church of Jesus Christ and his apostles. The Puritans wanted their followers to have a more direct relationship with God, and they did not see the need for church ceremonies, and repetitive prayers. Their movement especially appealed to the people that lived in the southeastern part of England including London, east Anglia, and Sussex. The majority of these people had been educated as apprentices and they were now small property owners, shopkeepers, artisans, and small farmers who belonged to the social class that was called the “middling sort.” As a whole, the middling sort class was much better off than most of the people who were living in poverty strewn England. Things would gradually change for the worse for the Puritan movement when in the 1620's the church courts began prosecuting growing amounts of outspoken Puritan members. Then things would deteriorate even further when King Charles I married a Catholic princess. At the time, he decided to bring back many of the elaborate ceremonies that had been abandoned to appease the Puritans. Indian attacks and a harsh winter had sent the first colonists to the New World fleeing back to England. Then, in 1614, the legendary John Smith explored the Atlantic seaboard of the United States. There he found an area that he claimed had the same soil and climate as England. He named it New England, and before long he was actively promoted the area. The idea of relocating there appealed to the Puritans. The first group of Puritans to migrate to New England were called Separatists, and they were later referred to as Pilgrims. In 1620, 102 of them crossed the Atlantic on the ship named Mayflower. They established a town called Plymouth on Massachusetts Bay. Luckily, the Native Americans in the area had been wiped out by an epidemic, and the colonists were able to occupy their village. The first winter was especially hard, and half of the people starved or died from the bitter conditions. In the following years they would learn to grow an abundance of crops. In 1630, there were 1,500 Puritans living in Plymouth colony. Then in 1630, a Puritan named John Winthrop obtained a royal charter as the Massachusetts Bay Company. Winthrop would lead the “Great Puritan Migration.” Almost 14,000 Puritans migrated with John Winthrop. Most of the followers were young single men who lacked opportunities in the mother country. Winthrop and his men quickly set up a republican form of government in which the Puritan men were allowed to elect the governor, lieutenant governor, and legislature. Before long, 30 percent of the immigrants that crossed the Atlantic Ocean ended up living in New England. John Winthrop was elected governor over and over until he died in 1649. By 1700, New England was the most populous of all of the colonies with over 90,000 people.